The 1952 United States presidential election in Vermont took place on November 4, 1952, as part of the 1952 United States Presidential Election which was held throughout all contemporary 48 states. Voters chose 3 representatives, or electors to the Electoral College, who voted for president and vice president. Vermont voted overwhelmingly for the Republican nominee, General Dwight D. Eisenhower of New York, over the Democratic nominee, former Illinois Governor Adlai Stevenson of. Eisenhower ran with Senator Richard Nixon of California, while Stevenson's running mate was Senator John Sparkman of Alabama. Eisenhower took a landslide 71.45 percent of the vote to Stevenson’s 28.23 percent, a victory margin of 43.22 percentage points. 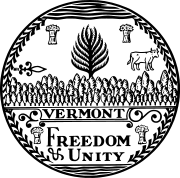 Vermont historically was a bastion of liberal Northeastern Republicanism, and by 1952 the Green Mountain State had gone Republican in every presidential election since the founding of the Republican Party. From 1856 to 1948, Vermont had had the longest streak of voting Republican of any state, having never voted Democratic before, and this tradition easily continued in 1952 with Eisenhower’s landslide win. Even as Eisenhower won a comfortable victory nationally, Vermont weighed in as a whopping 32 percentage points more Republican than the national average and with 71.45 percent of the popular vote, this made the Green Mountain State the most Republican in the union in the 1952 election. Eisenhower, a war hero and moderate Republican who had pledged to maintain popular New Deal Democratic policies, had wide appeal beyond the boundaries of the traditional Republican coalition. While Vermont was one of the only two states in the nation (along with Maine) to vote against Franklin Roosevelt all four times, the GOP margins in the state had narrowed substantially in the 1930s and 1940s, particularly due to the strong Democratic presence in the northwestern part of the state. However Eisenhower's unique personal appeal brought even that region back into the GOP coalition, and allowed him to break 70% in the state in both 1952 and 1956, the first Republican to do so since Calvin Coolidge in 1924, and the last to date. Eisenhower swept every county in Vermont, breaking seventy percent in nine of the fourteen counties. The three northwestern counties of Vermont had long been Democratic enclaves in an otherwise Republican state through the 1930s and 1940s, but Eisenhower finally won them back for the GOP. The region still remained the most Democratic in the state, as Eisenhower received less than sixty percent of the vote in Chittenden County, Franklin County and Grand Isle County, while every county outside the northwest broke sixty percent for Eisenhower and three broke eighty percent. With that, Eisenhower became the first Republican candidate since Coolidge to carry Chittenden County as well as the first since Herbert Hoover in 1928 to carry Franklin and Grand Isle Counties. ^ "1952 Presidential Election Statistics". Dave Leip’s Atlas of U.S. Presidential Elections. Retrieved 2018-03-05. ^ "1952 Presidential General Election Results - Vermont". Dave Leip's Atlas of U.S. Presidential Elections. Retrieved 2013-08-02. This page was last edited on 28 March 2019, at 03:36 (UTC).